Michel Foucault (1926-1984) was a French philosopher who wrote extensively on the subject of power, including the way in which it interacts with knowledge. Foucault’s most famous works are critical studies on social and medical institutions, including sexuality and medical anthropology. He was sometimes referred to as a postmodernist, but he did not personally accept the label. 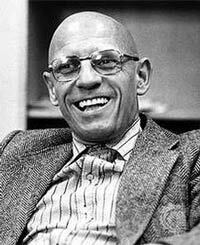 Foucault was born on October 15, 1925, in Poitiers in western France. His family was wealthy and somewhat conservative, with his father being a renowned surgeon in the district. The boy, his father hoped, would grow up to inherit his medical practice. He was, however, not successful in school, stating in later life that he had succeeded by working to stay ahead of a very attractive boy in his class. He then became adept at languages, particularly Greek and Latin. After the defeat of France by Nazi Germany in 1940, Foucault was sent to a Jesuit boarding school where he continued to improve academically, but he was lonely. He studied philosophy in his final year, graduating in 1943. After another year of study back in Poitiers, he went to Paris to be taught by Jean Hyppolite, an existentialist philosopher who specialized in the study of the works of Georg Hegel. Foucault was impressed by his tutor’s belief that studying history was necessary in order to develop deeper philosophical knowledge. Foucault returned to Paris in 1946 after obtaining entry to the prestigious École Normale Supérieure. He became withdrawn and unpopular while he was there. He read voraciously, especially the works of Martin Heidegger. He was also strongly influenced by the Marxist views of Louis Althusser, who taught at the college. Foucault became a communist in 1950, though he was an unorthodox one, rejecting the need for class struggle. He became disillusioned by Stalinist anti-Semitism, however, and left the Communist Party in 1953. Too ill to perform national service, Foucault took a doctorate in the philosophy of psychology, and meanwhile worked in research and teaching. His first book, On Mental Illness, was published in 1954, but was indifferently received. He spent the next five years traveling around Europe. His dislike of “Nordic gloom” militated against a career in cultural diplomacy, however, and he was happier giving lectures across Poland. His homosexual experiences were used against him by the government, forcing him to Germany. The 1960s saw Foucault win international acclaim with works such as The Birth of the Clinic and The Archeology of Fame. With The Order of Things, he came to the attention of a non-specialist readership, which was impressed by his argument that the nature of truth had changed through history as the notion of what constituted acceptable scientific debate had developed. By 1967, he was sufficiently famous to play a significant role in the unrest that swept many parts of the world at this time. He argued in favor of persecuted Tunisian students, even though in France itself he was sometimes derided for being insufficiently leftist. By the early 1980s, he was taking an active part in San Francisco’s gay scene, and is known to have been highly promiscuous. During this time, he contracted HIV, at that time still poorly understood. He was only finally diagnosed a few months before his death on June 9, 1984.